Make sure your coating is always at its best! BLACKFIRE Coating Booster will make sure that your ceramic, quartz, or resin-based coating is properly maintained and cared for. BLACKFIRE Coating Booster is designed using a pH-neutral formula that will ensure that it does not cause any damage to any part of your vehicle. As your coating ages, it will lose its luster, hydrophobicity, and protect. BLACKFIRE Coating Booster refreshes all three of these important factors and keep your coating in pristine condition long after it would have otherwise faded. Protecting your paint with a coating is one of the best decisions you can make. Designed to last longer with better protection, and product an amazing shine, paint coatings far outstrip the paint sealant and carnauba wax days. But, in order to keep your chosen paint coating performing it�s best, proper maintenance is required. That�s where BLACKFIRE Coating Booster comes in! BLACKFIRE Coating Booster will enhance your coating�s natural water sheeting and beading qualities while boosting the protection and durability. Specially formulated to enhance every good quality of your paint coating (water beading and sheeting abilities, protection from UVA rays, self-cleaning capabilities, etc. ), BLACKFIRE Coating Booster is a must � regardless of which paint, wheel, or glass coating you�ve coated your vehicle with. BLACKFIRE Coating Booster is to a paint coating what an instant detailer is to a carnauba wax or paint sealant. You shouldn�t have one without the other! 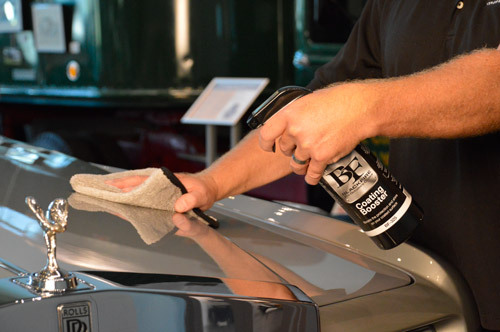 Use BLACKFIRE Coating Booster to restore the slickness and shine, as well as protection and water-beading of your existing paint coating � all in one application! Ensure the surface is clean and cool to the touch. Spray BLACKFIRE Coating Booster directly onto the surface and spread over the surface using a soft microfiber towel or applicator. Wipe surface until product disappears. Flip to a clean side of your towel and buff off excess residue. Continue around the entirety of the vehicle. Can be used on all coated surfaces including paint, wheels, and glass.